Origin and Habitat: Navajo County, Arizona. Habitat: It grows widespread mostly on shallow well-drained soils derived from Kaibab Limestone among rocks on the margins of canyons, on well-drained sunny slopes or on flat hilltops in Navajoan desert or Great Plains grassland. 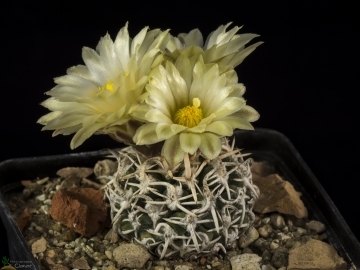 It is an extremely rare and localized cactus, with only five known populations, which comprise some 1,000 individuals in total. 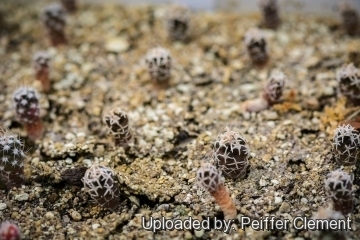 The potential habitat for this species is estimated to be some 11.5 square kilometers, but the cactus is found on only 15 to 20 percent of this land. It is threatened by habitat destruction and by illegal plant collection. 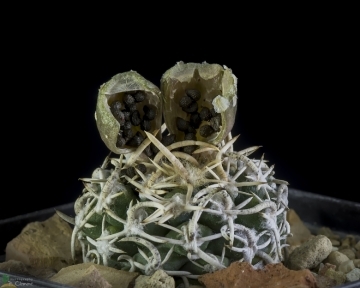 Drought has also been a significant threat to this cactus in recent years. Associated species include blue grama (Bouteloua gracilis), black grama (Bouteloua eriopoda), galleta (Hilaria jamesii), fourwing saltbush (Atriplex canescens), and sagebrush (Artemisia tridentata). Brady pincushion cactus (Pediocactus bradyi) also occurs close to this species. 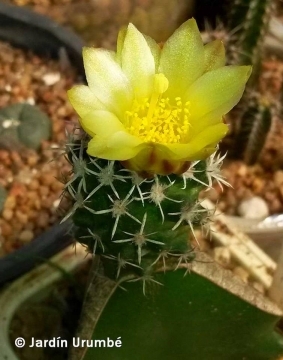 Description: Pediocactus peeblesianus (a.k.a Peeble's Cactus) is a very small, cactus that shrinks into the gravelly soils after flowering and fruiting. 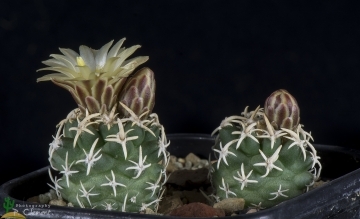 Habit: It is a geophyte cactus species and the body may shrink and disappear under the soil in times of drought. It is almost always solitary, although it may occasionally branch, possibly as the result of injury. Central spine: (3-)4 (rarely 6), of which 1 longer pointed upwards and 3 intermediate flattened into a Maltese cross arrangement, 0,5-2,5 cm long, mostly 0,5 mm wide at the base. Radial spines: 3-7 per areole, 2-10 mm long, recurving. 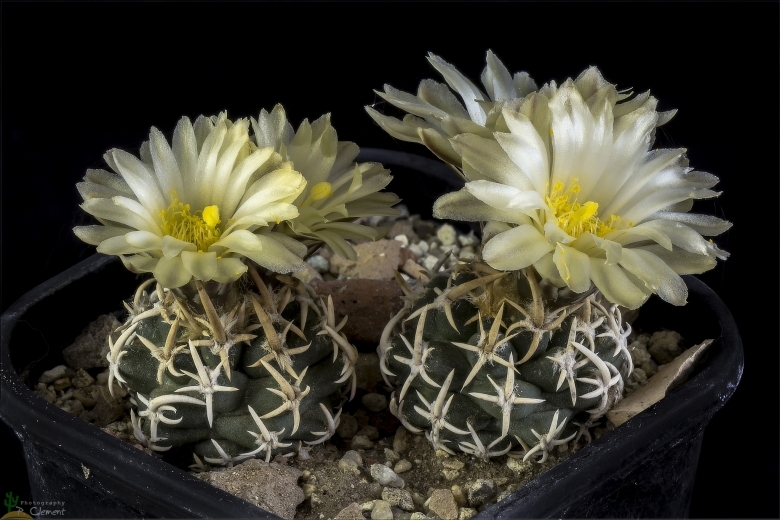 Cultivation and Propagation: Pediocactus peeblesianus is a most beautiful cactus but rarely seen in cultivation. It is quite difficult to grow on its own roots. Very easily rot! It’s thought that’s better to watch this species in photo or in the natural habitat rather than to try to cultivate it. For this reasons the plant is often grafted on a frost hardy stock.